1.2 How Do I Create an eBay Account? 1.3 How Do I Log In to My eBay Account? 1.4 Why Can’t I Sign In to eBay? Common Login Problems. 1.5 Where Can I Download the eBay App? 1.6 How Can I Delete My eBay Account? Login to eBay.com (USA and UK) and My eBay from your PC or via the eBay app. Everything you need to know about eBay, including common login problems, how to sign up for an eBay account, how to download the eBay app and how to delete your eBay account. eBay is an online shopping service, which was originally launched by Pierre Omidyar back in 1995. The service facilitates consumer-to-consumer and business-to-consumer sales, and while it originally started out as an auction service, it has since grown to include both auction and ‘buy it now’ style listings. The service itself is free to use, although sellers are charged a small fee for listing items and for successfully selling them. The site has operations in around 30 countries, while its headquarters is located in San Jose, California in the United States. As of 2017, there are more than 170 million active eBay users around the world. How Do I Create an eBay Account? The eBay sign up process is fairly simple and account registration can be achieved by visiting the homepage. At the top of the page, on the left hand side, you should see a message saying ‘Hi! Sign In or Register’. Click on the ‘Register’ link and decide whether you wish to register for a personal or business account. After entering your details, click the ‘Register’ button to continue. You will be automatically allocated an eBay User ID and this will be visible to other eBay users. If you are unhappy with the User ID you have been allocated, you can change it by going to ‘Account Settings’, then ‘Personal Information’ and clicking ‘Edit’ next to your User ID. The USA eBay Registration/Sign Up page can be found here. The UK eBay Registration/Sign Up page can be found here. How Do I Log In to My eBay Account? 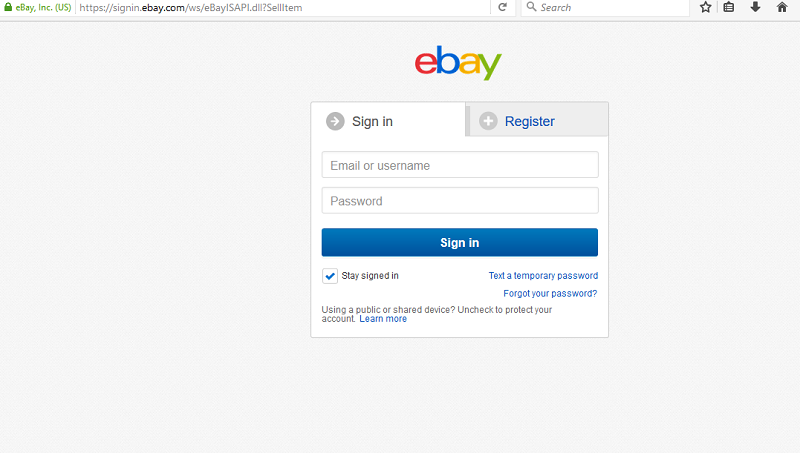 Once you have completed the eBay sign up process, you can then log in to your account from the eBay homepage. Like with account registration, you should look at the top of the screen, on the left hand side, where you will see the words ‘Hi! Sign In or Register’. Click on ‘Sign In’ and enter your email address and password. If you are using your own computer or mobile device, you can check the box labelled ‘Stay Signed In’ and your browser will keep you signed in until you manually log out, or until you clear your browser’s history, cookies, etc. However, if you are using a shared computer or mobile device, you should uncheck this box. The direct link to the eBay USA login page can be found here. The direct link to the eBay UK login page can be found here. The ‘My eBay’ login page is located here. Always pay special attention to the page and url, when you are attempting to login at eBay.com or eBay.co.uk Fake ‘scam’ or ‘phishing’ sites do exist, so please make sure that you are on the correct login page before entering your ID and password. This is especially important when clicking on links within emails or in ads. The official USA login page should look like this image, and the url will begin with https://signin.ebay.com/ for US, or https://signin.ebay.co.uk/ for UK visitors. Why Can’t I Sign In to eBay? Common Login Problems. Occasionally, users may experience eBay login problems and there are usually a number of common explanations. The first and most obvious thing to check is that you have definitely entered your email address or username correctly and that you have entered the correct password, paying attention to case sensitivity. If you have forgotten your eBay password, or if you think your account has been compromised, you can either click on ‘Forgot Password?’ on the main login screen, or click here. On the ‘Change Your Password’ screen, enter your User ID or email address and click ‘Continue’. You will then be emailed a link to reset your password. Users who have forgotten their User ID can login with their email address instead. However, you also have the option of clicking here and entering your email address. Your User ID will then be emailed to you. It should be noted that the email address you enter must already be linked to your eBay account. There may occasionally be issues with the website itself, or with its servers, meaning that a ‘Page Cannot Be Displayed’ message will appear. This is usually a temporary problem, which will be resolved in a few minutes, so simply try again later. If the problem continues, you may need to update your web browser or delete cookies. Users who violate the terms of service, or fail to pay the required eBay fees, may find that their account is suspended. When this occurs, an email will be sent, informing you of the actions necessary to have your account reinstated. This message can also be found within your eBay account, in the ‘Messages’ tab of the ‘My eBay’ section. In most cases, a one-off payment of fees will be required in order to have the account reinstated. Where Can I Download the eBay App? For mobile users, the process of buying and selling on eBay may be easier through the eBay App. At present, the app is available for mobile and tablet devices running either the iOS or Android operating systems and can be downloaded using the App Store or Google Play Store, respectively. To find the app, launch the relevant store on your mobile device, search for “eBay” and install the app in the usual way. Once it has been installed, you can launch the app and sign in with your usual login credentials. How Can I Delete My eBay Account? Please visit our page on how to delete your eBay account for a step-by-step guide to closing your eBay account. i keep getting my password rejected. i keep having to change my password.